I can’t remember the last time I dressed up for Halloween. No, it’s not that I’m old, and I wouldn’t exactly say I’ve been apathetic to the holiday either. I always go into haunted houses even though they terrify me, I love crisp, fall evenings around a bonfire as much as the next girl, and after making it through four years of college, parties—and chocolate—have become necessities. So I’m not quite sure how the dressing up aspect evaded me for so long. Nevertheless, I think the last time I spent hours agonizing over my inch-long, fluorescent fake finger nails was middle school. I know that in the past I’ve been a bedazzling witch missing two front teeth but sporting an awesome flappy skirt, Jasmine with a make-shift sapphire jewel headband rescued from an attic somewhere, a hippie with rainbow peace sign stickers stuck to my jeans, Dorothy from The Wizard of Oz who trailed red glitter from her shoes all evening, and in my very cute baby days, a chubby pumpkin. And now the moment has come for me to shine again. At my first official office Halloween party. Well, the winner does get a paid day off work, after all. Who wouldn’t dress up for that? I’ve decided to go as Katniss from The Hunger Games, complete with a hunting bow and Mockingjay pin. But the whole dressing-up thing got me thinking about the history of Halloween and how little I know about it. I even found myself flipping through the TV channels the other night, landing on the original, yes-Jamie-Lee-Curtis-is-really-only-20-but-looks-like-a-school-marm version of Halloween and realizing that I’d never seen it! How could this be?? Was I a bad American? Apparently so as the Library of Congress filed away the film in 2006 after they declared it was of enough socio-cultural importance to save for future generations’ viewing pleasure. It was time for a little research, and since that Halloween episode I caught on the History channel last year was fuzzy in my memory, I headed online. 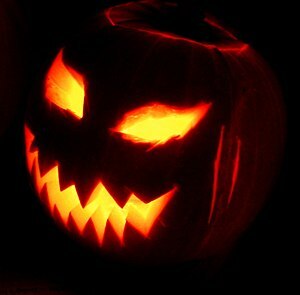 It turns out Halloween as Americans currently celebrate it derived from the ancient Celtic tradition of Samhain. This festival commemorating the end of the year took place on November 1 in what is today the United Kingdom, Ireland, and northern France. As the biting winds rose and the leaves fell from the trees, Samhain was a signal that summer—and the harvest season—were over, and that the harsh winter was upon the Celts. They killed the weaker livestock that would not survive the season, and soon the celebration became associated with death and the belief that a wall which served as a thin separation between the living and the dead was torn open during this time, allowing spirits to circulate among the living. Many stories surround the tradition of Samhain, and nobody knows which ones are true. Some say the Celts left offerings of food and drink to appease the dead on that day, others claim that the Celts dressed up to scare ghosts away. Communal bonfires were most likely lit to honor Pagan gods with fortune tellers gathering around the flames to predict individual’s future paths. The Celts even captured bits of this “sacred fire” in hollowed out turnips, gourds, and rutabagas to carry back to their homes, and this tradition is said to have begun our modern carving and lighting of Jack-o-lanterns as pumpkins were more plentiful in the New World. By the first century A.D., the Roman Empire had fought for, won, and begun to rule over most of the previously Celtic lands. Of course, they celebrated their own festivals in autumn around the same time as Samhain. One was Feralia, a day to honor the dead. The other was called Pomona for the Roman goddess of trees and fruit. Pomona’s symbol was the apple, which may have begun the Halloween tradition of bobbing for apples. In any event, over the next several hundred years, Christianity spread through the Celtic population, but Samhain could not be eradicated. So in 835 Pope Gregory IV moved All Saints Day—a Catholic holiday to honor dead church saints and martyrs—to November 1 to take attention away from Samhain. Nevertheless, parades, bonfires, and costumes still materialized in England the night before All Saint’s Day, which was also called All Hallows Day, and these evening ramblings became known as All Hallow’s Eve, and later, Halloween. Undeterred, the Catholic Church declared November 2 as All Soul’s Day to honor the dead who were not saints to try to stamp out Samhain for good. On All Soul’s Day, the poor of Europe would go “a-souling,” traveling door-to-door asking for food. In return, they promised to pray for the souls of their neighbor’s dead relatives. Church officials encouraged this practice and hoped it would replace the old Pagan tradition of leaving cake and wine out on the doorstep for dead spirits. Believers often dressed in saint and devil costumes during these evenings of roaming, and it is thought that when children adopted the practices of their parents, they threatened to start street fires or break the windows of those who refused to give them food. Before long, these youths might have begun dressing up to avoid being blamed for the mischief they caused rather than for religious reasons. So from the Celtic world lit only by fire to the mass commercialization of a holiday now only out-grossed by Christmas, we have the condensed history of Halloween. The only question left is . . . trick or treat?